Since Michelle Peng gave me a pack of Compost Cookie Mix from Williams Sonoma, I have been looking up Christina Tosi and her famous creations at the Milk Bar. The menu was online and I was immediately drawn to the cake creations. Such interesting combinations! Ok, that was a to-do list. But her signature creations were the compost cookies (for which I still have to make) and her crack pie. It was the banana cake that turned up on Oprah's website, where it was one of ten cakes baked for O magazine's anniversary. So I figure this one will be it. The recipe which was drawn from her book is on Oprah's site. This will be hubby's cake as he loves bananas and chocolate. Why I made him a banana chocolate cake last year as well. But this one will take it to the next level. I did start a week ago, making hazelnut brittle and from that, hazelnut paste. Didn't care to spend ? !&$@ on it when I could start from scratch. Will be making slight adjustments to this cake, but only where sequence and home made alternatives dictate. 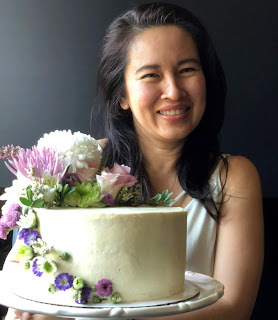 This will be my first multi step, multi layer cake and I plan to follow the recipe to a T, considering how I 'kinda' messed up my cake, so fingers crossed, tomorrow, B-1, I will be making the cake, banana cream, ganache and frosting, only to have to assemble the very day. Okay.. Just can't leave a good recipe alone. But my reasons weren't unfounded. I thought.. hmmm... banana cream, banana cake and the only chocolate will be in the ganache. I think not. So I made the necessary tweaks and made the cake a banana chocolate cake instead. Now I already measured out the dry ingredients into a bowl, and thankfully left to grocery shop without stirring in the baking powders and salt. It was in Safeway that I had a revelation, the light bulb moment. And when I returned to bake the cake, I slowly removed 6 tbsp of flour and subbed it with cocoa. And what a great move that was. My other option was to add chocolate chips to the batter once it was in the pan. But I liked the concept of chocolate banana cake, so there it was. And to keep the cake super moist, I did wait until it was lukewarm, then quickly wrapped it twice in plastic wrap and shoved it in the freezer, all 3 layers lay snug inside the springform pan. A trick I just picked up last week, not a moment too soon. so all that is left to do is the hazelnut frosting tomorrow along with the assembly. Removed the cake from the freezer, left for the temple and to get more butter. Then made the hazelnut frosting and the hazelnut crunch. Was a tad worried about the banana cream coz it was quite runny coming out of the heat, but after resting a night it firmed up well. Then the finale .. started assembling and layering. Wow, it is tall. It actually looked pretty presentable with just 2 layers finishing off with the hazelnut crunch on top. Guess that will be the 'quickie' option. Could also make a cupcake version with banana cream filling. Roast in the oven on 300F for about 20 minutes, then immediately wrap them in a kitchen towel to 'steam', wait for 3 minutes and rub them against the towel so the skins loosen and you'll have nice naked hazelnuts which will look better in the brittle and paste. 2. Spray a baking sheet with nonstick spray; set aside. 3. In a small saucepan, heat sugar over medium heat, swirling pot occasionally, until sugar melts and is amber in color. 4. Stir in hazelnuts to coat with caramel, and pour onto prepared baking sheet. 5. Spread nuts in a single layer with fork; let cool. 6. Then ground half of this in a food processor till just fine to be used for hazelnut crunch. 1. Mix 1 cup of sugar and 1 cup of water in a heavy saucepan. 2. After you've stirred the sugar and water, leave on medium high heat, and DON'T TOUCH. After about 10 minutes, it will reach a lovely golden brown in its darkest part, and that's when you add the hazelnuts. Quickly.. As the pan starts smoking big time! 3. Immediately pour the hazelnut pralines onto a baking sheet lined with greased parchment. 4. Break the caramel into pieces that will fit into your food processor. Start running your food processor, and add the pieces of broken caramel one or two at a time, and process until they're ground. The ground mixture will look like graham cracker crumbs, but keep processing. It will start to get smooth, like thick peanut butter. 5. At this point add a teaspoon of kosher salt, and keep processing. 6. Start adding oil – hazelnut oil is best, but walnut oil will work too. Any neutral oil will also work in a pinch (but I'd avoid canola – I think it has a nasty aftertaste). Add a tablespoon at a time, and process until the mixture reaches your desired consistency. (I used two tablespoons of walnut oil for mine). Just place all the ingredients in a bowl, stir to combine. Beat everything together until smooth and creamy. Refrigerate until firm enough to spread, about 15 minutes. 1. Microwave hazelnut paste, chocolate, fudge sauce, and salt on medium for 60 seconds, stirring after 30 seconds. 2. Remove and stir until chocolate is melted. 3. Gradually whisk in cream until blended, then stir in the Kahlua, if using. 4. Cover and refrigerate until cold. 5. Before spreading, microwave 30 seconds to soften. 2. Grease three 10″ x 2″ round cake pans. 3. Line bottoms with parchment. 4. Grease paper and dust pans with flour; tap out excess. 5. Whisk flour, cocoa, baking powder, baking soda, and salt in a medium bowl; set aside. 6. In a stand mixer with paddle attachment, beat butter until creamy. 7. Gradually pour in sugar; beat on medium speed until light and fluffy, about 3 minutes. 8. Add eggs, one at a time, until well blended. 9. Add bananas, buttermilk, and oil; blend until combined. 10. Add flour mixture and beat on low speed until blended. 11. Divide batter between prepared pans and spread evenly. 12. Bake until a toothpick inserted in center of cakes comes out clean, 20 to 25 minutes. 13. Let cakes cool in pans 10 minutes. Run a knife around sides of pans and turn cakes onto racks. Remove parchment paper; let cool. Wrap layers individually with plastic wrap, then freeze. 1. Combine bananas, 1/2 cup milk, and lemon juice in a food processor; process until smooth. In a small bowl, sprinkle gelatin over remaining 1/4 cup milk. 2. Whisk sugar, cornstarch, and salt in a medium saucepan. 3. Whisk in banana mixture, egg yolks, and 1/4 cup heavy cream until smooth and well blended. 4. Bring to a boil over medium heat, stirring constantly with a heatproof rubber spatula. 5. Reduce heat to low and cook 2 minutes, stirring constantly. 6. Stir in butter and reserved gelatin mixture and cook 1 minute, stirring constantly, to dissolve gelatin. 7. Pour mixture into a bowl and set in a larger bowl of ice water; stir occasionally until cool. 8. Whip remaining 3/4 cup cream just until stiff. Fold into banana mixture. Cover and refrigerate until cold, about 2 hours. I) Assembling the cake - on the birthday! 1. Place 1 cake layer on a cake stand or serving plate; brush top with whole milk. 2. Spread with half the ganache. 3. Sprinkle evenly with half the hazelnut crunch. 4. Spoon half the banana cream over top and spread evenly. 5. Repeat layering once, then top with last cake layer (brush top with milk), and spread the top with more ganache, letting it drip on the sides, then pipe the hazelnut frosting on top for a decorative effect. 6. Refrigerate cake at least 1 hour, covered loosely with plastic wrap. 7. 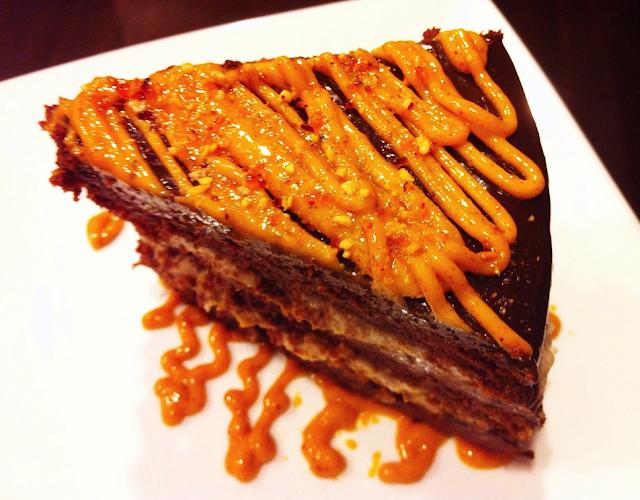 To serve, break remaining hazelnut brittle into small pieces and arrange on top of cake. What a fabulous creation it was. Yes, it was time consuming, but so worth the effort. 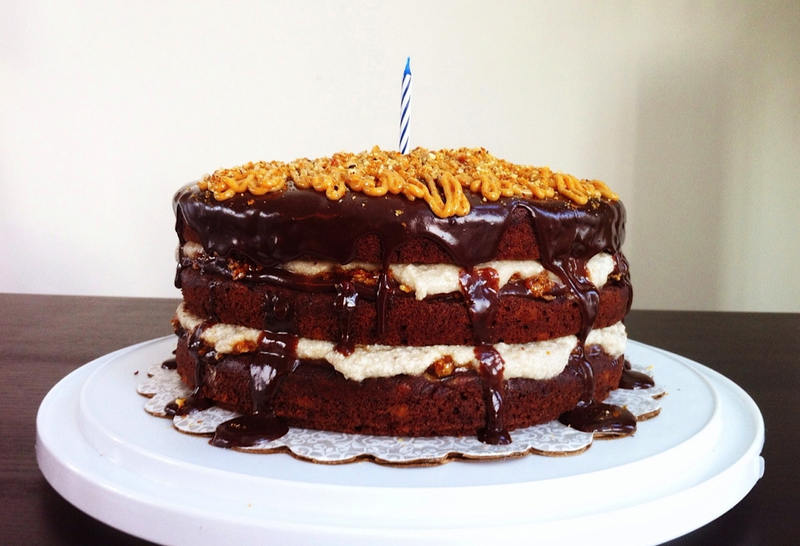 The hazelnut crunch, the moist cake, the silky banana cream, the smooth ganache together was a symphony of flavors that elicited a satisfying 'hmmmm' from my customers, not to mention the birthday boy.